Casio's high-speed shooter, the EXILIM PRO EX-F1has been given a firmware update that will allow users to prerecord footage before they even start shooting pictures. The update, named Ver 1.10 is the second firmware update by Casio, with the first offering a quicker startup time and better zooming when recording hi-def movies. 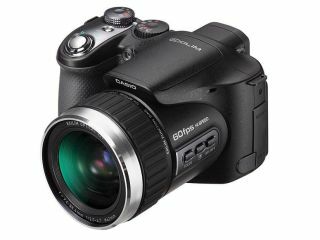 Casio's EX-F1 was released in March of this year and boasts shooting speeds of up to 60 images per second or 1,200 frames a second in Movie mode. Prerecord shooting offers the user to film up to five seconds before you press the record button, meaning that blink-and-you-miss-them shots can be captured. This was already in place with stills shooting, but now moviemakers can utilise the system as well. The way the system works is footage is constantly recorded to buffer memory, constantly wiping unless you press the record button. The use of firmware updates is nothing new in photography, with the likes of Canon and Nikon offering extras through their websites, but is does show companies listening to what users want and servicing those needs. The firmware Ver 1.10 update is available now at www.casio.co.uk.